The Good Behavior Game and the future of prevention and treatment. Kellam S.G., Mackenzie A.C.L., Brown H.C. et al. Addiction Science and Clinical Practice: July 2011, p. 73–84. From the researchers involved in the trials, a practitioner-friendly account of research on the classroom management technique implemented in the first years of schooling which has led to remarkably strong and persistent impacts on substance use and other problems in later life. Summary From the researchers involved in the trials, a practitioner-friendly account of the first long-term randomised trial of the Good Behavior Game classroom management technique, a brief review of findings to date of ongoing replication trials, and the implications of this work for researchers, practitioners, advocates, and policymakers. As analysed in greater details by Findings, the main trial in the US city of Baltimore recorded some of the most substantial effects ever recorded from a school-based prevention programme. Unusually, it was able to test whether effects persisted through to young adulthood. The game is not a lesson as such, but a way of managing whole classes during lessons. It aims to socialise children to the role of being a school pupil and to reduce aggression or disruptive behaviour, known to be related to later substance use problems and dependence and antisocial behaviour. Children are divided into teams which can win prizes depending on the good behaviour of the team as a whole. In the Baltimore study, teams did not compete against each other; each could independently gain rewards. Class teachers used the research team's assessments of their pupils (themselves largely based on the teachers' ratings) to assign them to three teams with the same numbers of boys and girls, and of aggressive/disruptive or shy, socially isolated children. 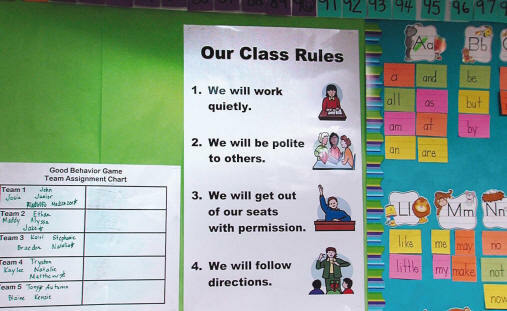 The good behaviour rules Such as not talking out of turn or leaving your seat without permission. teams had to adhere to win prizes were displayed to the class. During a game period, a mark was placed on the chalkboard next to the name of a team whenever one of its members broke a rule. Teams won if they chalked up no more than four marks by the end of the game period. At first teachers announced the start of game periods, which occurred at no set time but initially for 10 minutes three times a week. Praise plus tangible rewards such as such as colourful stickers or rubbers were awarded immediately after the game. As the year continued, the game was played for longer periods and when pupils were working individually. In this way, it facilitated learning without competing for instructional time. As the school year progressed, the rewards changed from tangible and immediate to more abstract and deferred, such as gold stars and more time for enjoyable activities. The game treats the classroom as a community. The teacher is central, because he or she sets the rules for becoming a successful pupil and member of the community and determines whether each child succeeds or fails. It improves the precision with which the teacher conveys and the child receives these rules, and by doing so improves teacher-child interaction and the child's chances for success. In addition, in trials better behaved children were seen to influence and socially integrate children who behaved less well. The very first mandatory school year is a key a setting for preventive interventions because it represents a major transition for the child and the family, and is generally the first where children at all levels of risk can be found. In some US states, apart from registering the birth, it is the first required contact between children and any official system. It is for many children the first setting outside the home where they learn the social and behavioral skills they will need to succeed in school. Improved social adaptation to the classroom due to the way teachers socialise the children is expected to lead to better adaptation to other social fields later in life, which in turn will improve the child's psychological health in a mutually reinforcing cycle. • these results support a role for universal (ie, applied to all children not just those at heightened risk) prevention interventions in a redesigned system for child development and problem prevention and treatment. Specifically, boys from the first study cohort who had played the game in first grade reported significantly fewer problems at ages 19–21 than peers who had received the schools' usual teaching. Results were particularly striking for children who had been most aggressive and disruptive in first grade. The game had little or no statistically significant long-term effect on the girls except for suicidal thoughts and, to some extent, alcohol abuse and dependence disorders. Impacts were clearest for the most severe illicit behaviours and disorders such as drug abuse and dependence, antisocial personality, and imprisonment for violent offences. Results for the second cohort of pupils were similar but there was some reduction of impact. The game still appeared to reduce drug abuse and dependence disorders, but instead of higher risk children benefitting most, the benefit was more general. No significant benefit was seen for alcohol abuse and dependence disorders, regular smoking, or suicidal thoughts or attempts. In other trials in the USA, Belgium and the Netherlands with as yet less extended follow-up periods, the game has been associated with benefits including reduced substance use and better behaviour and psychological health in childhood and adolescence. The main lesson from the trials is that a classroom behaviour management intervention directed at aggressive and disruptive behaviour in first and second grade can improve children's long-term prospects. Such behaviour is malleable to effective universal methods applied with fidelity and consistency. Impacts on highly aggressive and disruptive male first-graders are consistent with the inference that these behaviours lead in later life to substance use, antisocial and violent criminal behaviour, suicide, and other damaging outcomes. Minimal impacts in girls suggests that their aggressive and disruptive behaviour does not have the same importance as among boys: it is less common, less enduring from early to later schooling, and appears less salient for long-term development. Effects were greater and more consistent in the first set of pupils whose teachers were freshly trained and subject to continued monitoring and mentoring, suggesting that these supports may be needed There are other possible explanations, including the fact in the second set of pupils, teachers' ratings of early maladjustment were less closely related to later young adult behaviour, meaning that interventions designed to address these early signs might also have been less closely related. to maximise implementation and benefits, and in particular to focus benefits on the pupils most in need. At a policy and system levels, the Baltimore trial represents a step toward the long overdue integration of education research and public health prevention research. Further steps in this direction will be greatly facilitated by the extension of school information systems to record each child's progress in emotional and behavioural development, including his or her special needs. With appropriate safeguards and community involvement, this new data would alert educators, researchers, and clinicians to each child's early risk factors for outcomes such as those measured in the trial as well as other family needs. They would support more salient planning for – and responses to – the needs of the individual child, the classroom, and the school. The Good Behavior Game is a universal intervention for the entire classroom population, not just those who are at higher risk. It does not single out and risk stigmatising aggressive or disruptive children. Like most such interventions, it reduced some individuals' risk and averted some adverse outcomes, but not everyone's. Children who do not respond well to a universal intervention are candidates for more targeted preventive or treatment interventions. The Good Behavior Game can help identify these children. A coordinated system of staged interventions, consisting of a tested universal intervention backed up by empirically proven group and individual interventions, meets the needs of individuals at all risk levels and stages of problem development. It yields efficiency and economy by differentiating lower risk individuals and higher risk responders from those who need more invasive and costly help. commentary Apart from the remarkable strength and persistence of the impacts, there are at least three other key points about the intervention and the findings. First, unlike most other school programmes, the Good Behavior Game does not occupy precious curriculum time. It is a way of managing a class while teaching the school's usual curriculum. To the degree that it works, teachers can expect to be able to teach less disruptive classes more effectively. Secondly, partly because there is no 'subject' content, the intervention intercedes at the level of how the pupil relates to the social world around them and vice versa. The result is a range of beneficial effects. These are most easily documented for the minority of youngsters most likely to develop unhealthy relationships, but the benefits should extend to their friends, families, neighbours and colleagues, and to the broader society which is relieved of responding to proscribed and/or antisocial behaviour. The strategy is consistent with the observation that typically children develop a constellation of mutually aggravating problems, related the further back one looks to a shared set of factors affecting children's mental and physical well-being. Among these is a positive school environment, found in other studies to be strongly related to substance use. Thirdly, and again unusually, the Baltimore study directly measured problem substance use outcomes, not use as such, so sidestepped the criticism that experimentation with substances is relatively normal behaviour sometimes falsely dubbed a problem. For more see the Findings analysis of scientific reports on the Baltimore and other studies of the Good Behavior Game. The analysis also considered how the game might fit with UK education practice. Available from the US Coalition for Evidence-Based Policy is an account of the research and a link to the Good Behavior Game manual used in the Baltimore study. Thanks for their comments on this entry in draft to Sheppard G. Kellam of The Johns Hopkins University in Baltimore, USA. Commentators bear no responsibility for the text including the interpretations and any remaining errors.